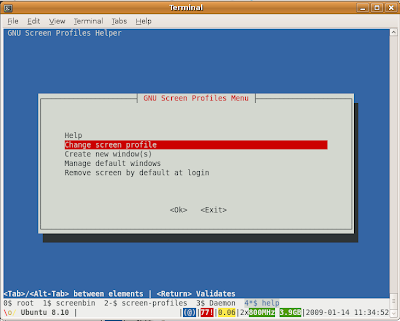 On December 14, 2008, I posted about screen - the window manager for the Ubuntu Server. A lot has happened since then, mostly over the Christmas and New Year's holidays. 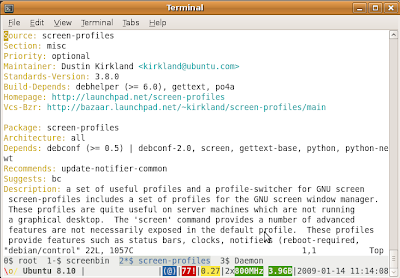 With the help of Nick Barcet (and contributions from several others, including Dave Walker, Jamie Strandboge, Nicolas Valcarcel, and Marc Deslauriers), we have a new package in Ubuntu Universe for Jaunty: screen-profiles. I'm quite proud of what we've accomplished thus far with the package--we're bringing some bling to the Ubuntu Server. Across the bottom, we have panel displaying a three-color logo, the Ubuntu release, a notification that a reboot is required (@), 77! updates are available, the current system load is 0.27, the system has 2 cpu's, currently running at 800MHz, 3.9GB of memory, the current date and time. All of this in less than 80 characters. Above the status panel is another panel, showing the open windows in the current screen session. You can see that I have 4 windows dedicated to: root, screenbin, screen-profiles, and Daemon. This is intended to communicate some of the same information available in the upper and lower panels on your Ubuntu desktop. Nick has created the excellent screen-profiles configuration utility, accessible by pressing F9. From the Help screen, you can see the hotkeys we have defined within this custom screen profile, to help navigate among your windows. Beyond the Help screen, there are several other functions available on the main Menu. These are intended to help you customize and improve your screen experience. I find the last option most interesting. Here, you can toggle screen-by-default. If you turn this on, each time you ssh into your system, or open a new terminal on your desktop system, you automatically launch into a screen session (reconnecting to an existing one if available). I'm enjoying this feature quite a bit! Based on that feedback, I'm going to push a Main Inclusion Report for screen-profiles, and add screen-profiles to the Ubuntu Server Seed. Dustin, I've really been loving this for a month, and so have some of my friends. I'm wondering why the screen command keystroke was changed from Ctrl-A to Ctrl-G? 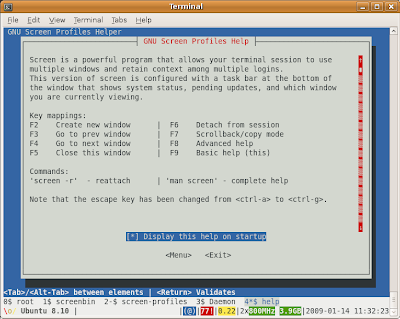 ctrl-a is already used on any Linux (and Ubuntu by default) system that has emacs keybindings in the shell. ctrl-a brings the cursor to the beginning of the line. How about a dark background theme? The current theme uses a white bar for the bottom two lines, which is quite bright on a server console. Hmm, it's light-grey on my screens. I figured that was somewhere between light, and dark, and thus would work adequately on both dark and light terminals. You're welcome to submit your own custom profiles for inclusion in the package, if you'd like. We'd be happy to have other contributions, and would carefully consider any proposed patches or branches in Launchpad. Very cool! It's amazing how these ancient, free tools can evolve with the help of some creative folks like you! Nice work. Another cool idea I really want to work on someday is, if you connect to a GNU Screen session from GNOME Terminal (or Konsole, or whatever) have it recognize you're using Screen and show windows as GUI tabs.